Because there wasn't one, I wrote a Wikipedia entry for the Gary Highway, which you can see at this Wiki site. It contains more geographic info than this blog entry and there's also a useful map at the Wild Discovery Guides site. We came down the top 700 km section of the CSR to Well 33 and Kunawaritji in September 2007, and then 400 kms down the Gary Highway to Everard Junction. It's then still a further 400 kms down the Gunbarrel/Heather Highways and Great Central Road to the Warburton Community. Although the Gary Highway almost dead straight (except for a section at the northern end where it winds around some sanddunes), and plenty corrugated, there are some interesting diversions along the way. 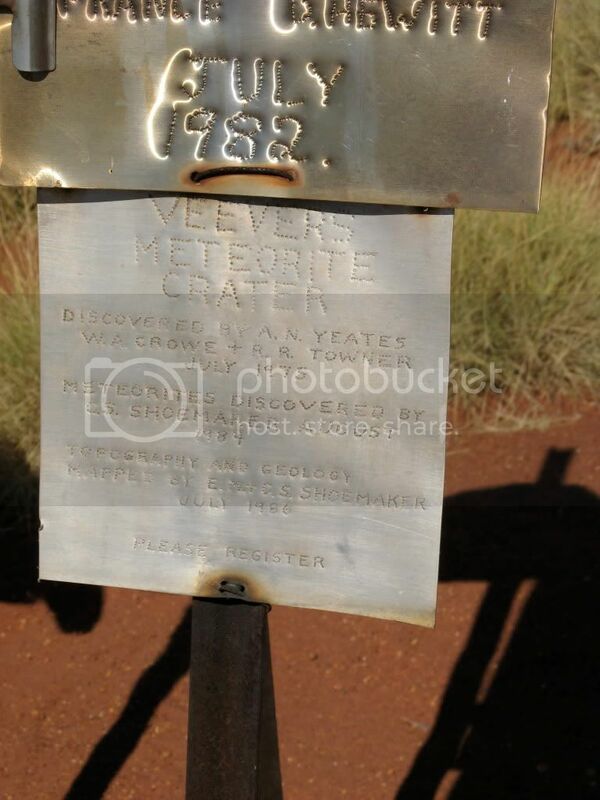 1) Veevers Meteorite Crater, 16 kms off the track. These are the original hand written notes in the visitors book at Veevers Meteorite Crater by Eugene Shoemaker, who confirmed Veevers as a meterorite impact crater. Eugene Shoemaker was a world renowned meteorite expert from the USA who searched the world for impact craters, and documented most of those in Australia. His biography can be found here and a Wikipedia entry here. He became a good friend of Len Beadell and visited Australia often. The Shoemakers named an asteroid, discovered by Caroline Shoemaker in 1980, after Len Beadell. It is now known as 3161 Beadell (1980 TB5) and is 12.5 km in diameter. Len and his family visited the Shoemakers in the US during 1986, and sadly, it was on the Shoemakers next trip to Australia, on 18th July 1997, that Eugene was tragically killed in a car crash in the Tanami Desert. Subsequently, some of his ashes were carried to the Moon by the Lunar Prospector space probe, and to date, he is the only person to have been buried on the moon. The background to this tribute can be seen here. This is a video of Veevers Meteorite Crater in 2007. Markers are located at several places around the latitude of the actual Tropic, since it's position has been recomputed and changed as the earth's tilt varies. The earth's axial tilt varies between 22.1° and 24.5° and is currently 23° 26’ 21.448”. In 1900, it was 23° 27’ 8.26”. See this Wikipedia entry for more details than you'll ever need. Len Beadell spent several days stuck here in a sand storm, hence the name. 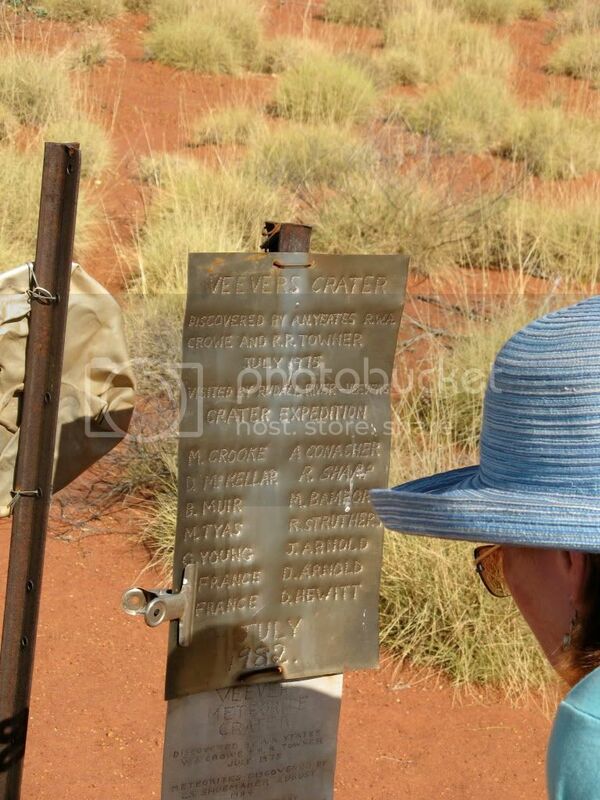 4) McDougall Knoll, a good lunch spot overlooking the Gibson Desert. Look for the tin can (visitors book) lodged in the cairn. 5) Eagle Highway Junction, which looks very overgrown. The view from the top of McPhersons Pillar. A lonely spot in a big desert. Look for a glass jar (visitors book) hanging from a bush. You can camp in this track loop. 9) Everard Junction with the Gunbarrel Highway at the southern end of the Gary Highway. It doesn't look it, but it was a stinking hot 40º that day. From there the track east leads to Mount Beadell, then down the Heather Highway to the Great Central Road. Mount Beadell. Well worth the climb and there's a good campsite at the base. One of Len Beadell's few remaining original signs, still there, no doubt, due to the 23 nails holding it to the tree. There are no buildings or facilities of any kind along the Gary Highway (or Gunbarrel/Heather Highway sections either) and it is very remote from any help. In the 5 days and 800 kms from Kunawaritji to the Great Central Road we saw not a single vehicle or person. No permits are required for the Gary Highway itself (or the CSR, unless you deviate off it) but they are needed for the connecting roads and tracks (Great Central Road, Gun Barrel Highway and Gary Junction Road). Permits are easily obtainable on-line.